Common types of pillows include natural fill pillows such as feather, down or a combination, synthetic fill pillows and foam pillows such as memory foam and latex. If you do a quick search about “luxury pillows” online, you will find out that most of the information about it will lead you to hotel pillows. This is one of the key identifiers of luxury pillows — when it is commonly used in hotels. If not, its qualities and characteristics must be very close and comparable to those being used in high-class hotels. Why Should You Spend Your Money on Luxury Pillows? A pillow is just any other regular pillow until it’s labeled as “luxury pillow”. So what exactly is a luxury pillow? Does it have any difference from other conventional pillows aside from the usually heftier price tag? Note that the following qualities may or may not be featured across all kinds of luxury pillows. However, you must know that these are what you can usually expect. We will be discussing in detail later on all the qualities to look for when shopping for the best luxury pillows so that you can be well informed before spending your money. You will probably think it is impractical to put your money on pillows that are quite similar to cheaper non-luxury pillows. While that may be true to some extent, there are still many factors to consider that will lead you to coming up with a decision in favor of luxury pillows. While this type of pillow is not for everyone, there are many consumers who can attest to the fact that their luxury pillow purchase is one of the best decisions they ever made. A lot of people put the blame on their mattress when they’re having a hard time having a good night’s sleep. They search for the best mattress and spend hundreds even thousands of dollars just to make sure that they have a bed that can give them the best quality sleep. When you already have a great, or at least decent mattress, and your sleep quality hasn’t improved much, then it’s time to take a look at your pillow. A pillow can offer the right cushioning for the upper body. The correct position is the best way to get great quality sleep. The best pillow can help prevent back and neck pains, as well as align the spine correctly as you sleep. Even your usual sleeping position must be taken into consideration. The pillow size is an important factor. The height and width of a pillow can help in offering the best support and cushioning. According to some physiotherapist, pillows can help improve the quality of sleep and how a person feels throughout the day. Because we spend more or less a third of our lives in bed with our mattress and pillows, it is never considered a waste of money if you choose to invest on your beddings. After a long day at work or in school, you deserve nothing less than a relaxing and rejuvenating resting time, and you can have the best of that experience with the help of luxury pillows. Down Pillows — Down pillows are made with down clusters or down feathers. These are the feathers found under the tougher feathers on a bird’s exterior. Pillow manufacturers usually make use of duck and/or goose feathers. There are some down pillows that are mixed with regular feathers; however, a pillow must contain at least 75% down feathers for it to be considered a down pillow. Feather Pillows — Feather pillows use duck or goose feathers as filling. These pillows sometimes contain down clusters too. If a pillow has more than 25% feather, then it is a down-feather mix pillow and not a down pillow. If there are no down clusters in a pillow, then it’s a purely feather pillow. Memory Foam Pillows — Memory foam has become a common choice when it comes to pillows because of its ability to contour to neck and head, hence providing better support. Check out some of the best memory foam pillows. Down Alternative Pillows — Down alternative pillows aim to mimic the comfort and feel that down pillows can offer. It uses natural or synthetic fibers that are usually hypoallergenic. 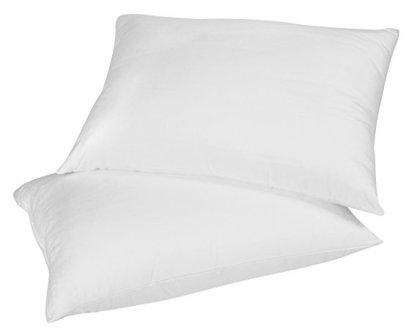 Down and feather pillows can sometimes be harmful to allergy sufferers, unless classified hypoallergenic, hence the popularity of down alternatives. Furthermore, down alternative pillows are usually more affordable than real down pillows. Synthetic Fill Pillows — Synthetic fill pillows are usually made with polyester material. These are also ideal for allergy sufferers because of the absence of feathers. It is good to know that when you’re purchasing a down or feather pillow, you usually have duck or goose feathers as options. Goose feathers are considered as generally the better option compared to duck as these have less odor and are smoother as well. If you are a sensitive sleeper or if you suffer from allergies, you must check whether the pillow, especially if down or feather, is hypoallergenic. When the advertisement of a pillow doesn’t indicate that, then don’t risk it. When in doubt, call the manufacturer’s customer support directly. When shopping for the best luxury pillows, one must take into consideration several factors to ensure that the pillow can truly be considered luxurious. As mentioned several times earlier, these factors include durability, comfort, the pillow type and more. We will be discussing these in detail below to help you out in choosing the best luxury pillow that’s perfect for you. You should first check the pillow type. Check the common types of luxury pillows that were listed above and see what best fits your taste. This quickly narrows down your list of luxury pillows. When shopping for a luxury pillow, find out the pillow type. Some are combinations of the above pillow types so make sure you take a look at the product description first. Size matters. The width and height of the pillow is an essential factor as it contributes to your preferred comfort. If you are a pillow hugger or a side sleeper, a pillow with a larger width may fit you best. Of course, a contoured pillow, usually memory foam types, is meant for the head and neck and not for hugging. Common sizes include Standard, Queen and King. How a pillow feels or the level of comfort it can offer depends on your preference. One may be perfectly comfortable for one person but too uncomfortable for another. The firmness level is also a matter of preference. Some like sleeping on soft and fluffy pillows while others prefer firm and flat or contoured pillows. This is the part where you can check whether a pillow is best for your sleeping position. Experts agree, and many reviews from actual consumers attest to medium firm pillows for back sleepers, firm and super firm pillows for side sleepers, soft pillows for stomach sleepers and medium firm pillows if you have no specific position when sleeping. As much as possible, you want your pillow to last for a very long time, especially if you spent a large amount of money for it. There are some people who keep their pillows for decades, while others change every few years or so. While the frequency of pillow replacement is all up to you, the longevity of the pillow depends on the pillow itself. Of course, you can’t keep on using a pillow that has sagged through the years or have lost way too many feathers through time. Check on the thread count of the pillow cover as well as this contributes greatly to the durability of your pillow. Lastly, look into special features the luxury pillow can offer. It can’t be called luxury pillow if there isn’t anything special about it whether it has an extra-special fabric cover,it has hypoallergenic features, temperature regulation features or others. There are thousands of pillows available in the market today, although you have limited choices when it comes to luxury pillows. However, despite the fewer choices, finding the best luxury pillow still proves to be a challenge because there are still plenty that look very convincing. Because of this, we are helping you narrow down your choices by ranking the top 10 best luxury pillows where you can base your decision. We took into consideration the qualities and features that were mentioned earlier, as well as reviews and ratings of actual customers and critics. Simplicity is the key feature this luxury pillow exhibits, but its greatness is yet to be discovered. With a universal tone of white, this sleep essential can fit any bed setup and room accents with its immaculate white color. The bedroom pillow is also filled with fluff that keeps it soft, plump and comfortable to the user. The pure white pillow with thin, rope-like piping on the edges is a great addition to the bedroom as it can be dressed in beautiful pillowcases of your choice. The sizes that are available for this luxury set of pillows are King, Queen, and Standard. Made from 100% cotton, this luxury pillow is enveloped with only the best and high-quality products to aid your sleep and repose needs. The wonders of the cotton material benefit a lot of advantages to the best quality and energy recharge of the person using this pillow. This soft, fresh and skin friendly cloth is capable of providing breathable, comfortable and serene moments in bed to any users. Those with sensitive skin types are not going to worry about catching allergies, itch and sinus reactions due to the easy to clean, long-lasting and cozy feel the pillow provides to users. Expect only stellar product and service from the East Coast Bedding pride. This luxury pillow is stuffed with superior class European white goose down that provides divine comfort as if you are floating on the clouds! The grand experience that awaits with this luxury pillow set is made in the USA with keen attention in creating only premium quality, soft goose down pillows for your everyday lives. The 100% cotton shell is satin in texture, adding royalty to the supreme luxury pillow for your bedroom needs. The 400 thread count cotton fabric stuns with its compact and snug finish. This set of luxury pillows is specially made for bedroom needs as for its size and dimensions. However, with its soft, cozy and heavenly sensation it brings when used, people may carry these pillows during trips and even for a nap anywhere at home. Durability is one of the aspects that makes this luxury pillow stand out from the rest as it can accompany your sleeping and resting routines for long years to come with its top of the line materials. This authentic beauty is truly a must-have due to its immaculate expertise in delivering the best sleep that will make you feel like a king! Everything about this beauty is perfection! Another beautiful bed pillow is here to make the public excited about the wonders the leading sleep expert brand Continental Bedding has to offer. The pure white luxury pillow is an immaculate paint that can fit all kinds of bedroom setups, paint, and themes in a heartbeat. This set of two beautiful clouds of cotton is sewn on the edges with a neat backstitching technique without bulges, rope piping or ruffled style sides. The pillow can be easily clothed with any décor of pillowcases to match a room or a style the user prefers. You can purchase this lovely set in different sizes of Standard of one piece, Standard set of two, Standard (Soft) of one piece, Standard (Soft) set of two, Queen of one piece, Queen set of two, Queen (Soft) of one piece, Queen (Soft) set of two, King of one piece, King set of two, King (Soft) of one piece and King (Soft) set of two. The fabulous set of bedroom pillows is made of only the best 100% white goose down soft pillow that can give you the experience and comfort you yearn to have in the search for the top set to equip on your room. This set is equipped with 100% cotton material that serves as the protective shell of the splendid soft technology going inside of the pillow. Cotton is a smart choice in designing a bedroom pillow as it can make you feel at ease after a long day. The breathable nature cotton provides allows you for better breathing while asleep at whatever position you are lying on. The magnificent softness and comfort this bedroom pillow brings is something to chase for from the leading brand Continental Bedding. The remarkable fluff that this pillow adds to your sleep routine is a big plus in regaining the strength you need for the day. The relaxing softness that resembles a bed of feathers for only the royals to rest on. There is nothing more rewarding than to lay your back in your comfy bed, rest your head on a soft pillow and relax your body in a lovely bed. This set of pillows can bring that sweet dream into reality. Nothing beats the stellar durability that this set gives to the public. With the high-quality materials that compose the luxury bed pillows both from the inside and exterior, this pillow can sustain the stand of time despite using it as your favorite pillow. You can expect only the softest, cuddliest and best companion that never disappoints. The typical pillows may tend to down and deform over use, but expect this set of the pillow to soothe your tired, long days during your stay in bed. Nothing to hate about this set of beauty! Another staple beauty is here to astound you with its simplicity until you discover the awesomeness it brings to your life. 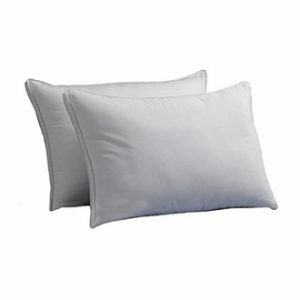 The Beckham Hotel Collection Luxury White Down Feather Pillow (2-Pack) – Premium 100% Cotton Shell – King is your perfect companion if you want to complete your bedroom ensemble at home or even at your lodging enterprise. You don’t need to go the extra mile on spending some bucks for a getaway vacation. With this beautiful set of pillows, your staycation will definitely far better with your relaxing time at home. This set of luxury pillows are wrapped in pure white cloth, with dainty rope-like piping along the edges. The supreme pillow set is available in King size. The 100% cotton cover owes all the customers with the outstanding softness, smoothness, and breathability of the fabric. The protective shell is composed of the comfortable premium cotton cloth that can be compatible with any skin types—whether sensitive or normal ones. The pillows are beautifully made with precise sewing technique to ensure that the sleep equipment is intact and compact for long use and test of time. The pillow set is stuffed with Beckham Hotel Collection down feather pillows that are authentically made in the USA with precision to detailing, designing and manufacturing. The beautiful, white set of comfort boosters are soft, fluffy and cozy to lay on. With the premium materials that are used to create this essential sleep companion, you are assured of a heavenly repose that will get you sleeping soundly like a baby! The durability factor of the luxury pillow set exceeds all expectations. If you are searching for a stellar sleeping pillow that can give you comfort, durability, and safety, then this one is what you are looking for. The pillow set is hypoallergenic with dust mite, mold, and mildew resistant feature to keep you and your loved ones secured from bacteria and virus infection. They are perfectly compatible and friendly to use for those with conditions such as asthma, allergies and other respiratory illness. The beautiful set of pillows are also made with great precision to deliver only the most excellent, long-lasting bed pillows that will give you the best sleep for ages! The pillow that will keep your eyes looking for more is the FineFeather 100% Hungarian White Goose Down Pillow, Luxury 700 Fill Power, Queen Size. With the gorgeous white protective covering that is complemented by vertical lines of shiny, satin-like accents that add irresistible charm to the overall appearance of the pillows. This luxury pillow can be a great ornamental item to your bed and can be used with or without pillow covers. This beautiful pillow can be purchased alone or in pairs in sizes of Standard, Queen, and King. The 100% cotton material that serves as the covering of the pillow ensures that the Hungarian goose down inside is well kept and maintained to provide only the best sleep experience for your relaxation. The medium density pillow allows the customers to enjoy a soft, comfortable and breathable sleep without the pillow being too soft or hard for the head. The premium quality pillow is equipped with 330 thread count that allows for the ultimate sleep experience for your sleep and repose moments at home or even out on a vacation. You may easily take this bed luxury pillow along with your road trips and camping adventures. Enjoy the comfort only your wildest dreams can imagine anywhere, anytime with this spectacular product brought to us by FineFeather. This plump and gorgeous pillow set is the best gift you can ever give yourself as a treat for a bedroom essential. Not only do these pillows ease the stress and tiredness from a long day outside, but it also comforts your head, neck, and muscles with its super comfortable feel on the body. This magnificent performance is assured to last longer and it is not a one time promise that never sticks to its words. FineFeather aces the performance, durability, and beauty factor with this wonder pillow from their line. If you are searching for an eye candy to decorate your bedroom and private space with, then Italian Luxury got something that will add a royal touch to your throne. 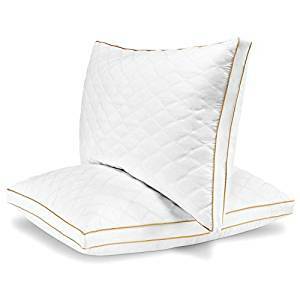 Introducing the fabulous and beautiful pillow that will get you the charm of a princess from a kingdom– Italian Luxury Quilted Pillow (2-Pack) – Hotel Quality Plush Gel Fiber Filled Pillow with a quilted cover and sateen piping – Hypoallergenic & Dust Mite Resistant – Queen. The pillows are decorated with diamond patterns on the façade with golden piping on the edges of the pillow. This beauty is available in Queen size. The bed luxury pillow will make you feel like you are on a vacation getaway with the high-quality material used to cover the pillow’s interior. The plush gel fiber stuffed pillow is a compact, comfortable and well-packed sleep companion that can is protected with quilted cloth and sateen golden piping on the edges. You can enjoy the lovely experience with the reliable materials used to create one great buy, giving you the privilege only those in the high-class suites experience through the comfort of your own home! The softness of this Italian Luxury ensemble is what most people look for the perfect sleeping pillows. Aside from the wondrous beauty it shows, these pillows are also a beast when it comes to comfort and softness. With the plump pillow set that allows you to lay on the clouds, you may be in trouble of oversleeping due to the serene sleep Italian Luxury pampers you to feel! Indulge in peaceful repose with the remarkable pillow that aces both beauty and comfort. The surreal sound sleep experience is real with this product. You will be astounded to know that this great buy is also long-lasting and durable when it comes to usage and time factors. You can expect the pillow set to serve you for years to come without the hassle of the interior deforming, downing or shrinking into the hard pile as time passes by. This wonder sleep equipment is all you’ve been searching for, and now it’s here to answer your sleeping problems. 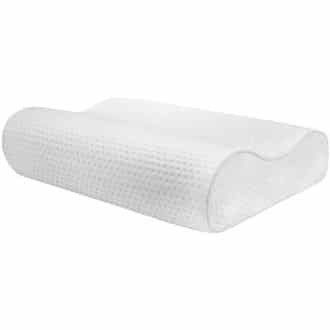 If you happen to stumble upon the Snuggle-Pedic Bamboo Shredded Memory Foam Pillow on sale, which is usually the case, don’t miss the chance to purchase it. As many owners would share on their reviews, this might just be the best pillow ever. It is decently priced as a luxury pillow on regular days, and when on sale, it is not far from a conventional pillow’s price. The best part is that this memory foam is not just like a regular memory foam pillow as it has special features you will surely appreciate. This memory foam pillow is not the regular type of memory foam pillow that you are probably used to. That regular type of memory foam is usually an entire solid pillow that’s usually firm and has a defined shape. The shape of the Snuggle-Pedic Bamboo Shredded Memory Foam Pillow looks just fine but what makes its special is its shredded memory foam feature. Because of this, the pillow never goes flat and it can even be machine-washed. It is available in Standard, Queen and King sizes. When it comes to comfort, you are pretty sure you’ll be getting the best with the Snuggle-Pedic Bamboo Shredded Memory Foam Pillow. As mentioned, many owners would say that this is the best pillow ever. Without looking at its special features or its good looks, you will appreciate this pillow simply because it is very, very comfortable. It is great for orthopedic support but it is also fluffy and soft at the same time, which makes it great for all types of sleeping positions. Even better, since it is not made with solid memory foam, its shredded pieces of foam plus the ultra-luxurious Kool-Flow Micro-Vented Bamboo Cover makes it such a breathable and cooler pillow to sleep on. Aside from its 90-day sleep trial, you’re getting a 20-year warranty with every purchase of the Snuggle-Pedic Bamboo Shredded Memory Foam Pillow. Yes, the manufacturer was confident enough to back up this pillow with 20 years of warranty so you’re pretty sure it will last that long. The foam used is CertiPUR-US certified, which guarantees no heavy metals and harmful chemicals were used. It is hypoallergenic too! 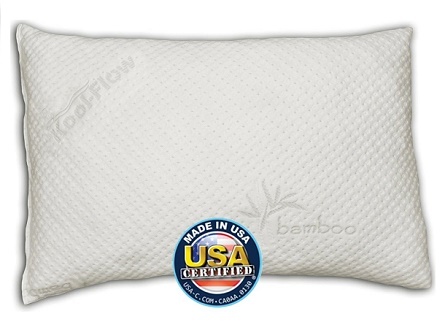 The Snuggle-Pedic Bamboo Shredded Memory Foam Pillow is proudly made in the USA so you’re rest assured of great quality with every purchase. The Royal Hotel’s Down Pillow might seem pricier than most of the other luxury pillows on this list but we believe it is actually a very practical choice. First of all, it is a luxury pillow so you can’t expect it to be cheap. Second, this pillow comes in a set of 2, which is just perfect for most sleepers. Most of us can’t have just one pillow, right? Here are some of the best down pillows. The Royal Hotel’s Down Pillow is a genuine down pillow. It is made of 90% down feathers and 10% smaller feathers. It boasts of 750 fill power, which is at the luxury level and 35 oz fill. It cover is made with 100% cotton for a softer, more comfortable feel. The Royal Hotel’s Down Pillow is available in Standard/Queen and King sizes. These are pillows that are actually being used in hotels. At 750 fill power for the King-sized Royal Hotel’s Down Pillow, these can be classified as somewhere between soft and medium firm. It is made with a cotton cover for a softer and more comfortable feel. Down pillows are generally more comfy compared to other pillow types and since this is 90% down, then you know for sure that you can get the best sleep all the time. If you like fluffy pillows best, you can fluff the Royal Hotel’s Down Pillow in your dryer every now and then. Made with 500 thread count fabric, the 100% cotton cover of the Royal Hotel’s Down Pillow does well in keeping the feathers inside the pillow and off your bed. It is made with very durable and high quality materials with superior workmanship in mind. The edges of the cover feature double silky piping for an cleaner finish. The Royal Hotel’s Down Pillow is special because aside from being a genuine down pillow, the feathers used were purified to make it hypoallergenic. If you’re worried about getting a feather pillow because you’re prone to allergies, then the Royal Hotel’s Down Pillow can make a whole lot of difference for you. This is probably one of the most affordable luxury pillows you can find. If you’re a fan of soft pillows then the Luxury Sealy Posturepedic Hypoallergenic Soft Down Pillow may be the best option for you. It is proudly assembled in the USA to guarantee superior workmanship. Since it is quite cheap considering that it’s a purely down pillow, you will surely want to get a few of these pillows to fill up your bed. The Luxury Sealy Posturepedic Hypoallergenic Soft Down Pillow is a genuine down pillow made with 100% white duck down. Fill power is at 525 to 550. It is so easy to maintain as it can be machine-washed and dried. Though it is only available in Standard Size, you will surely appreciate all the cozy nights you can get from this 20 x 26-inch super comfortable luxury pillow. The Luxury Sealy Posturepedic Hypoallergenic Soft Down Pillow is a very soft pillow although it can give enough support where needed. However. it is best for stomach and back sleepers, as proven by the many happy owners who were generous enough to share their feedback. It is very comfortable with 525 to 550 fill power of white duck down. Its cambric cotton cover adds a lot of comfort too. The Luxury Sealy Posturepedic Hypoallergenic Soft Down Pillow is manufactured by DOWNLITE bedding, which is fast becoming one of the trusted bedding brands in the market. It is assembled in the USA for guaranteed superior quality workmanship. Expect this pillow to last for many years to come, which makes it a very practical choice since it is quite cheap considering its type. The Luxury Sealy Posturepedic Hypoallergenic Soft Down Pillow comes with a 230 thread count cover made with cambric cotton, that’s not only durable but can prevent the down from leaking. It is hypoallergenic too, which is a great plus, as down pillows that are hypoallergenic are usually more expensive. Don’t be fooled by the $100+ price tag because the Queen Anne Pillow Company Heavenly Down Pillow is affordable as it comes in a set of 2. This pillow set is truly one of the best choices out there and in fact being used in plenty of the world’s top luxury hotels including the New York Palace, Marriott and Hilton. If these hotel giants trust the Queen Anne Pillow Company Heavenly Down Pillow, why shouldn’t you? First of all, don’t be confused by the pillow’s name. It is called Heavenly Down but it isn’t exactly a down pillow. It is a down alternative. This luxury pillow is hypoallergenic and made with Queen Anne Co.’s exclusive synthetic down alternative. It doesn’t only feel good; it looks good too with its clean white cover. It is the brand’s bestseller and comes in Standard, Queen and King sizes — just perfect for your collection of pillowcases. Comfort is within reach with the Queen Anne Pillow Company Heavenly Down Pillow because each size comes with three firmness levels — soft, medium and firm. This only means that you are not limited to one choice, but you can choose firmness according to your preference. 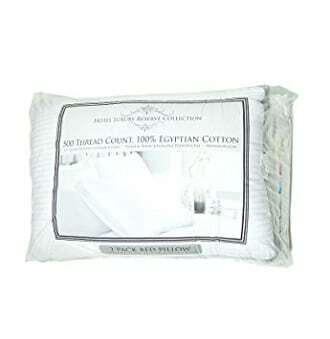 Because of this, the Queen Anne Pillow Company Heavenly Down Pillow is definitely one of the most comfortable pillows you can find for as long as you choose the best firmness level for you. 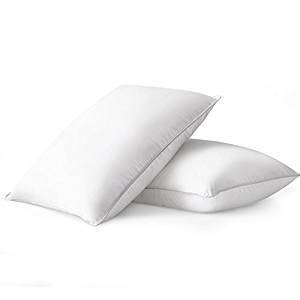 The Queen Anne Pillow Company Heavenly Down Pillow is made especially for side and back sleepers and is effective in preventing and easing neck and back pains. When it comes to durability, you won’t be disappointed with the Queen Anne Pillow Company Heavenly Down Pillow. 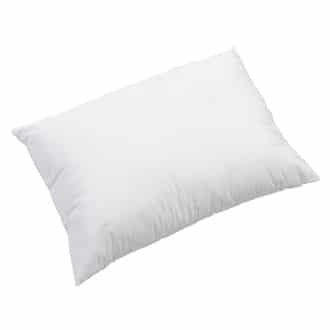 This pillow comes with a 230 thread count cotton ticking cover, which adds to comfort and durability. 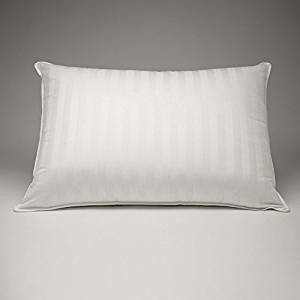 Furthermore, the Queen Anne Pillow Company Heavenly Down Pillow is handcrafted, features piped edges for added durability and promises a consistently perfect fill to avoid sagging. Since it is a down alternative pillow, you can be guaranteed that the Queen Anne Pillow Company Heavenly Down Pillow is hypoallergenic. Another down alternative pillow that made it to this list of ten luxury pillows that are considered best in the market today is the Duck & Goose Company Luxury Down Alternative Pillow. Though classified as a luxury pillow, this is a very affordable choice. 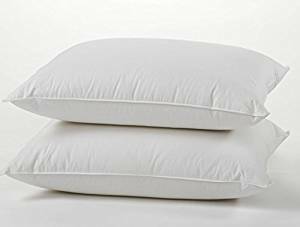 A 2-pack pillow set can be purchased for less than a price of 1 or even a fraction of a price of 1 compared to the other pillows on this list. Despite its low price, you’re still getting a high quality pillow that’s comparable to those being used in five-star hotels. Truly, you’re getting a great deal with the Duck & Goose Company Luxury Down Alternative Pillow. The Duck & Goose Company Luxury Down Alternative Pillow is made with 100% microfiber filling and covered with a premium quality 100% cotton cover. The cover is stylish with its jacquard print design and made durable with double needle stitch and supportive piping. You can get the Duck & Goose Company Luxury Down Alternative Pillow in Standard, Queen and King sizes, individually or in a set of 2. The filling weight of the Queen-sized pillow is at 1.4kg per pack. 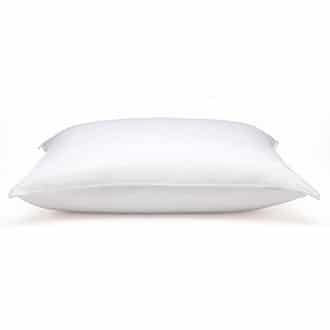 Classified as medium to firm, the Duck & Goose Company Luxury Down Alternative Pillow is designed for best support of the shoulders, neck and head when asleep. You will wake up refreshed and rejuvenated, free from pains and aches. 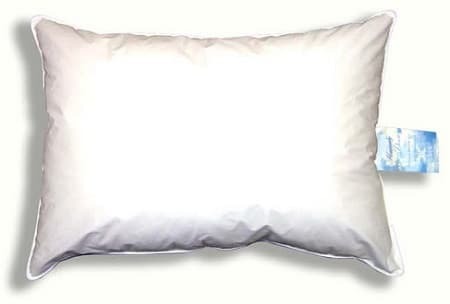 The Duck & Goose Company Luxury Down Alternative Pillow’s fiber filling is made with 100% siliconized blown cluster polyester that feels exactly like real down pillows. For reliable durability, only the finest quality materials and superior workmanship were used with the Duck & Goose Company Luxury Down Alternative Pillow. Owners would generously leave reviews about the Duck & Goose Company Luxury Down Alternative Pillow saying that they’re very satisfied not only by the comfort but also by how this pillow remains fluffy through time. It is a gusset pillow that’s made with a 2-inch strip of fabric between its top and bottom so the Duck & Goose Company Luxury Down Alternative Pillow stays in shape through the years. It is hypoallergenic and can be easily cleaned through machine washing and drying. For your peace of mind, Duck & Goose Company offers a two-year warranty with each purchase. 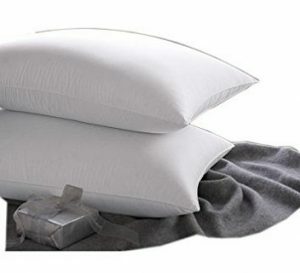 Very affordable as it comes in a set of 2, the East Coast Bedding Luxury Goose Feather and Down Bed Pillow is everything you can expect a luxury pillow to be. It is fluffy yet supportive enough, which makes it perfect for all kinds of sleepers. It is proudly made in the USA to give you the assurance of superior quality and workmanship. It has received high ratings and great reviews from owners. There’s nothing more you can ask for and the East Coast Bedding Luxury Goose Feather and Down Bed Pillow might just be the best pillow you will ever own. As the name says, the East Coast Bedding Luxury Goose Feather and Down Bed Pillow is a combination of goose down and feather. It is made up of 15% goose down and 85% goose feather. As you may know by now, goose feathers are considered generally better and more luxurious than duck feathers. The East Coast Bedding Luxury Goose Feather and Down Bed Pillow is available in Standard, Queen and King sizes and comes in sets of 2. The East Coast Bedding Luxury Goose Feather and Down Bed Pillow is at the soft comfort level. If you’re looking for a firm pillow, this may not be the one for you. The standard size has a 30 oz filling, 38 oz for the queen and 45 oz for the king-sized pillow — just the best amount of fluffiness. It is great for all types of sleeping positions and you will surely have better quality sleep with the East Coast Bedding Luxury Goose Feather and Down Bed Pillow. 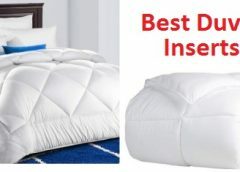 The East Coast Bedding Luxury Goose Feather and Down Bed Pillow is quite affordable compared to other luxury pillows on this list; however, quality and durability was not sacrificed at all by the manufacturers. Its cover is made with a 300-thread count 100% cotton fabric striped shell with piped edges for better durability. Cleaning comes easy too as this pillow can be machine-washed and dried. Perhaps the only downside is that the manufacturer hasn’t indicated whether the East Coast Bedding Luxury Goose Feather and Down Bed Pillow is hypoallergenic, which makes it not ideal for allergy sufferers and sensitive sleepers. No upfront warranty information has also been provided so it is best to contact customer support directly. Another set of pillows that won’t break your budget is the Exquisite Hotel Luxury Plush Down-Alternative Pillow. You will surely get that same luxurious comfort you always expect from hotel pillows, without having to pay such a huge price. The best part is that you can enjoy this luxury every single night in the comfort of your home. It is a down alternative pillow that stands out because of its gel-fiber filling. It promotes coolness for a better sleep that will certainly help give you the best mood as you wake up in the morning. You can get the Exquisite Hotel Luxury Plush Down-Alternative Pillow in individual purchases or by sets of 2 or 4.
the Exquisite Hotel Luxury Plush Down-Alternative Pillow is down alternative pillow that’s hypoallergenic, which makes it perfect for sensitive sleepers. It features superior gel-fiber filling that helps in making the mattress more breathable and cooler through the night. It is absolutely vegan as it contains zero feathers. The Exquisite Hotel Luxury Plush Down-Alternative Pillow is available in Standard, Queen and King sizes. For such an affordable set of luxury pillows, which is just about as much as how you would expect some conventional pillows to cost, the Exquisite Hotel Luxury Plush Down-Alternative Pillow is exceptionally comfortable. It is ideal for stomach sleepers but also recommended for those who need a lot of support on the neck and back. It helps ease pains and aches as it gives you the best, most comfortable and coziest healthy sleep. Once again, the gel-fiber filling does a lot in adding comfort to this pillow. The filling of the Exquisite Hotel Luxury Plush Down-Alternative Pillow is made with 100% hypoallergenic polyester gel fiber. It is USA-made for guaranteed superiority in materials and workmanship. Its cover is a 220-thread count poly microfiber fabric that keeps your pillow in shape through the years. Though there isn’t any warranty information available upfront, you can request this directly from the manufacturer’s customer support. 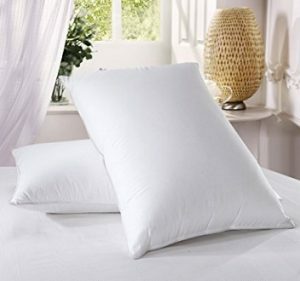 However, you will appreciate the numerous ratings and reviews available for this pillow that gives you the confidence that it will surely last for many years of great sleep every night. 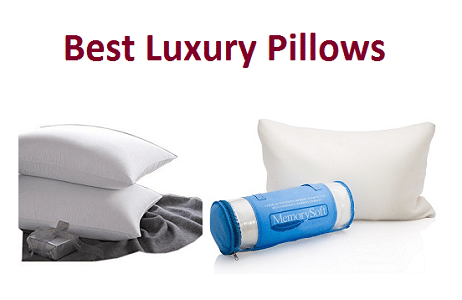 This is the most affordable among the pillows we have on this luxury list. If you want a set of luxury pillows, or even if you’re looking for one that’s perfect for gift giving, then this is the best option for you. The Hotel Luxury Reserve Collection Bed Pillow is available in a set of 2 and is made with premium materials for utmost comfort all night long. Based on hundreds of reviews from happy owners, this pillow doesn’t easily go flat and you can expect it to last for years. It is a gusset pillow too, meaning there’s a 1.5-inch height on it that helps retain its shape. The Hotel Luxury Reserve Collection Bed Pillow is a down alternative pillow. It offers the same comfort of genuine down pillows minus the hefty price tag. It comes in a King-sized set of 2. But because it is very affordable, you can easily get a few sets so you can fill your bed and make it cozier with these premium pillows. It is definitely comparable to those being used in hotels and we are guessing that it is indeed used by many first-class hotels. After all, this gusset down alternative pillow exudes nothing but class and elegance for a much lower price. While the manufacturer hasn’t offered the information on its firmness level, owners were generous enough in sharing that this is an extremely soft pillow. However, it remains fluffy through time and doesn’t go flat. It is big and very luxurious-looking — it will look absolutely lovely on top of your bed. These aren’t temperature-regulated pillows so it can get warm at times; but no worries as the warmth contributes to the comfort and coziness of the Hotel Luxury Reserve Collection Bed Pillow. There is no upfront warranty information on this; however, it is very acceptable if it doesn’t have any warranty coverage at all. The Hotel Luxury Reserve Collection Bed Pillow, after all, is very affordable. Thankfully, the numerous comments from owners that you can find online will give you added confidence about its durability and longevity because there are very few negative comments you can find, and almost none of them pertain to the durability of the Hotel Luxury Reserve Collection Bed Pillow. This pillow features premium down alternative fill that’s guaranteed hypoallergenic. Its cover is made with a 500-thread count 100% Egyptian cotton fabric, which doesn’t only add to its elegance but durability as well. 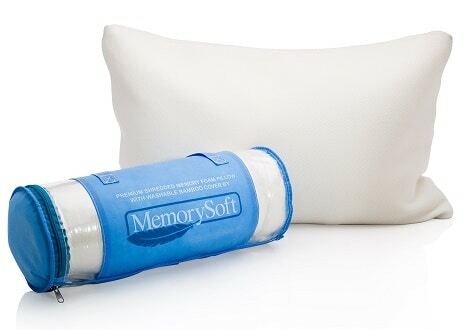 It’s hard not to fall in love with the Ultra-Luxury Shredded Memory Foam Pillow By MemorySoft. It looks great, it feels great and it ships to you in a vacuum-compressed, rolled package. It even looks great if you plan to give it as a gift. Once you lay down on this pillow, you’ll never want anything else. It is very affordable too so you can surely get a few of these for maximum comfort every night. The Ultra-Luxury Shredded Memory Foam Pillow By MemorySoft is a memory foam pillow featuring shredded memory foam made with premium materials. Although it is only a standard-size pillow, it fits twin to king cases without any problem. The Ultra-Luxury Shredded Memory Foam Pillow By MemorySoft is filled with shredded memory foam; however, the secret to its ultimate comfort is the thin memory foam shell that wraps around the shredded pieces. It is washable and allergen-free, which makes it perfect even for sensitive sleepers. The fabric of its cover is made with bamboo-blended material, which helps maintain freshness and coolness through the years. The foam used is CertiPUR-US certified that gives you a guarantee that no harmful chemicals and metals were used in making this product. Perhaps the 30-day money-back guarantee of the Ultra-Luxury Shredded Memory Foam Pillow By MemorySoft may not be enough to prove its durability as that offer can only give you the comfort guarantee. However, the owners of Ultra-Luxury Shredded Memory Foam Pillow By MemorySoft have nothing but good things to say about it. It remains soft and fluffy through time and contours to the head and neck’s shape very well. It doesn’t go flat through time and you can be absolutely sure that this pillow will last for many years to come. After all, the very low price of the Ultra-Luxury Shredded Memory Foam Pillow By MemorySoft especially if you catch it on sale is a bargain, so there’s nothing much to lose when you try it out. The Sensorpedic Luxury Extraordinaire Contour Memory Foam Neck Pillow is exactly how you would imagine a memory foam pillow to look like. One side is thicker than the other and its contoured shape offers utmost support for the best type of sleep. It is fairly priced, considering its jumbo size and features. If you want a luxury pillow and considering a memory foam type, this is a great option for you. Check out more of the other best memory foam pillows. The Sensorpedic Luxury Extraordinaire Contour Memory Foam Neck Pillow is made with memory foam. It measures 14 x 21 inches and comes with a 4 and 5-inch lobe on each end. This gives you the freedom to choose which end is more comfortable and supportive for you. Its cover makes it such a luxurious pillow because of its 300-gram weight triple layer that comes with a luxurious circular knit fabric. This helps in adding ventilation and makes the pillow easy to clean. Again, there’s only one size available but it is big enough and fluffy enough for those who love large pillows. The Sensorpedic Luxury Extraordinaire Contour Memory Foam Neck Pillow features the Ventilation iCool Technology, which offers a more breathable and cooler sleep. Temperature regulation is normally an issue among memory foam pillows and mattresses, but Sensorpedic has effectively solved this problem. The foam used is CertiPUR-US certified, which guarantees comfort and performance. This certification also gives you the confidence that no harmful chemicals or materials were used in the product. It is made to contour to the body’s shape, which gives effective therapeutic relief. For its price, you are truly getting a bargain out of the comfort this pillow can offer. Aside from the fact that the Sensorpedic Luxury Extraordinaire Contour Memory Foam Neck Pillow is CertiPUR-US certified, many comments and reviews left by owners prove that it is indeed a durable pillow that is meant to last for years. It is constructed with special odor-free sensor-foam memory foam that ensures that your pillow stays in shape through the years. There aren’t any indications though that it is hypoallergenic so it is best to contact the manufacturer directly if you are prone to allergies. There is no warranty coverage offered upfront as well; however, you may also call customer support for this information.